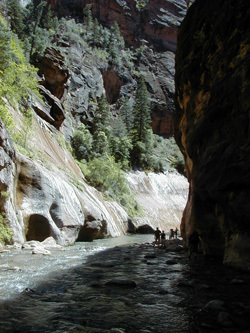 The 116-page book provides 17 stories of nature from Zion National Park. These stories offer an excellent way to learn about the plants, animals and geology of this beautiful and unique national park. The information offered goes beyond that available in identification guides. Beeplants and Whiptails delves beneath the surface beauty of Zion National Park to describe natural communities of birds, plants, reptiles, and mammals. It is a book for people who love this red rock country and enjoy a good story. The author takes us along as he hikes through scenes of life uniquely adapted to this desert setting. Written in a conversational style, these short narratives go beyond a simple natural history of Zion National Park. They convey the author’s passion for this canyon country, offering rich details of these communities and their inhabitants. Using his powers of observation and extensive research, he paints with words, developing scenes of deep canyons, fir forests, and desert scrubland. 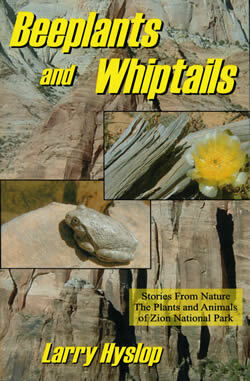 The resulting book is an excellent companion during any visit to Zion National Park.